BTSKY A4 Document Bags Portfolio Organizer are guaranteed to give 100% satisfaction in every way. We stand behind everything we sell. Return anything purchased from us at any time if it proves otherwise. We do not want you to have anything from us that is not completely satisfactory. BTSKY A4 Document Bags Portfolio Organizer is perfect for great for keeping you organized.Especially when you are on vacation or business trip, it will keep everything you need at hand, tidy and organized, make travel a lot easier. Portable: Sometimes you don't need your whole backpack! You can enjoy this because it holds everything you need. There is a also a carry handle on the top for a travel light. Versatile: Perfect for school, home and office use, everyone who love to be organized will enjoy this orgaizer bag, various pockets will hold everyting you need to carry. Waterproof: This portfolio bag is made from waterproof material to protect papers inside from damage.The bag is well made to last long. Giftable: Smart gift for Birthday, Back to School and Christmas. Portable Size: Approximately 9.84"L*1.18"W*13.39"H(25*3*34cm), perfect size for traveling. Functional Portfolio Organizer Bag: Versatile configurations with the ability to hold alot without bulk or feeling overloaded. Fit for 13'' macbook, Pads, Kindle, planner, journal, papers, notebooks, pens/pencils, sticky notes,highlighters and many more. Waterproof Material: This document bag is well constructed with polyester nylon, durable and waterproof, which keeps important items inside safe and dry. 8 Pockets Inside: There are two external pockets for easy access and also a convenient handle to carry it, inside you have 8 more pockets of various sizes to organize all your tablet, extra notebook, wacom, portable phone charger and power cord, plus your loose papers. 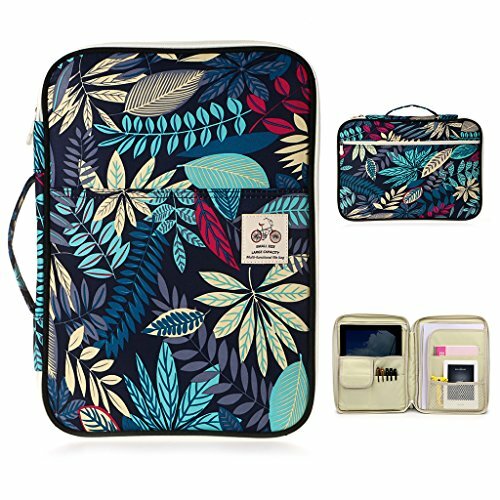 Travel with Ease and Style: This travel file holder will keep all your important things organized, in one place and ready to go. Great for the office to keep everything within reach or to make a mobile office to carry what you need on the go. Perfect for traveling.